“I was in my 9th standard when I joined VIDYA. I passed my 10th standard SSC exams in 2008 with 64%. I was able to continue my education because of the support from VIDYA. I got admission in Night School and enrolled in coaching classes. To my delight, I scored 66% in HSC and the next stop was a degree. Jayshree Ma’am helped me get admitted to college and coaching classes. Last year, in 2013, I graduated with a Bachelor in commerce with 56%. This has been a major achievement for me. I am the first graduate in my family and I am also the first graduate of VIDYA Mumbai. It gives me tremendous joy to know that I have that place in VIDYA. I am working as an Admin Executive in TCS now and I would still like to study further. I want to do an MBA and I am saving up to fund my own education. I will always be grateful to VIDYA for all that they have done for me. I am not referring to only financial help but also how they contributed towards my personal growth as a human being. I have become more confident, better at time management, better at interacting with people and learnt to deal with my problems in a more effective way. I realise the importance of education and want to educate my sister who just passed her 10th with 69%. I want her to be independent and self-reliant; and the only way to be like that is through education. Nisha joined BalVihar School when she was in preschool. Her father is a vegetable vendor and her mother is a homemaker. Together they earn a meager salary for a family of five to sustain themselves. She is one of two sisters and has one brother. Right from the beginning, Nisha had a passion to study and she always scored at the head of her class. With help from BalVihar, her older sister was admitted to Manav Bharti Public School. Nisha’s father wanted her to study in a public school as well. He completed the daunting task of submitting her application to Saint Anthony School. Nisha was among 16 children from around Delhi called there for a written test, which only 5 children would be accepted. Nisha scored so well on the test that the school authorities preferred her and admitted her immediately. This high level of achievement has givenNisha a boost of self-esteem and is a positive step toward freeing her family from the cycle of poverty. Gulab is the son of a farmer and attended Bal Vihar until 5th grade. He was then accepted into a local public school to further his studies. Due to family circumstances he had to return to his family’s village after completing the 8th grade. There he completed 12th grade and was determined to go to college. Gulab’s persistence paid off and he graduated from Indira Gandhi National Open University with his Bachelor of Computer Applications. He is currently pursuing his Master of Computer Applications and aspires to work at a multinational company. Coming from such destitute circumstances his life outlook could seem very bleak, but with his unwavering resolve, he was able to overcome his difficulties and surpass his own expectations. Anisha is a bright 10th student at the VIDYA School in Gurgaon. She comes from a humble background, her mother is a homemaker and her father is a laborer. It was a difficult childhood-Someone fed her some poisonous sweets, the after effects of which still trouble her.Then, at the age of 7, she had an accident which fractured her right hand. Her hand did not heal properly and it was very difficult for her to learn how to write. She thus has challenges with learning in the classroom. Though she has some disabilities, she does not let them get in the way of her dreams and aspirations. Her wonderful mind and her sheer determination have driven her to successfully complete every grade since preschool at VIDYA. Along with her written and oral skills, her self confidence has greatly improved throughout the years. She is eager to learn and regularly attends school and was recognized recently when she received a certificate for not missing a day of school. Anisha’s story is inspiring in that where most tend to lose hope due to their circumstances, she chose to rise above her situation to pursue a better life for herself and her family. Abha began going to the VIDYA School in Gurgaon when she was in preschool. In 2013, she lost her father to TB. Her mother’s lone paltry salary as a domestic worker was not enough to sustain their family of five. With the emotional and academic support of her teachers, Abha continued her education and began work as a domestic helper to assist her mother in making ends meet. Balancing school, work and caring for her siblings was a grueling task for such a young person. Her academics began to slip and she struggled to keep afloat. She is now in the 10th stnadard and her grades are gradually improving. She takes part in all school activities and even qualified to run in a marathon in Delhi.Today, Abha is concentrating on her studies and dreams of becoming an architect. She is blessed with a good soul, kind heart and determination that will move mountains. Manoj lives in 10×10 asbestos shed in the Powai Labor Camp right behind the plush homes of Hiranandani. The labor camp has around 500 sheds/homes which are granted to families who work for a particular construction companies under contract. With Manoj scoring 85%, the hopes of his family have gone sky-high. Manoj was with VIDYA for more than 5 years and has completed the basic computer program. Prema was enrolled in Beyond School Program from class 6. Her father passed away while she was all geared up for her Class 10 exams. But she did not let her performance fall and successfully passed the exams with flying colors (69%). She is at present studying at Parag College, Bhandup. Prema aims to study Banking and Insurance Course once she completes her Class 12. Babu joined Vidya in class 5. He has got 72.20% in class 10. He is the second person in his family to pass class 10. His mother has been a constant source of encouragement. His mother is very jovial to talk to and she strongly believes that education is the only way to get out of the poverty cycle, and this is what she wants for Babu. His family is extremely proud of his achievement. His favourite cricketer is Suresh Raina and he hopes to acquire Raina’s flamboyance someday! Santhosh is a VIDYA Bhavishya yaan student of class IX and has inspired many of us. He recently lost his father to excessive drinking and a paralytic attack. He has to work night shifts to make ends meet for himself, his three siblings and his mother. However, nothing has stopped this young man from attending his regular classes and he has been participating in all VIDYA events and celebrations. He studies well and his academic performance has also been good. Santhosh has been very eager to learn. Sushmitha is a brilliant VIDYA child of Bhavishya yaan at Gottigere high school, Bangalore. She is the elder of the two siblings. She does all the household chores as well as cooking and getting her younger siblings ready for school as her mother has to leave for work at 5am. 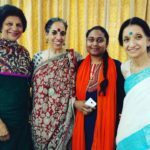 Sushmitha says that she has grown and learnt so much after her association with VIDYA Bhavishya yaan. She says that she loves every minute of being with us. She has a very positive spirit despite of all the hard work she has to do. She wants to become a language teacher and work for the betterment of society as she feels education is the only way a society can change. Our Karnataka State Spelling Bee champion, Reshma is the class topper and never misses a class. A student of class IX at the VIDYA Bhavishya Yaan Program in Gottigere, she is very responsible and forthright. Our New Annual Report is Out Now! Sanjana and Babu Modhale Make us Proud!